Intended for both the student and the practitioner, this is the first user-centered design casebook. It follows the Harvard Case study method, where the reader is placed in the role of the decision-maker in a real-life professional situation. In this book, the reader is asked to perform analysis of dozens of UCD work situations and propose solutions for the problem set. The problems posed in the cases cover a wide variety of key tasks and issues facing practitioners today, including those that are related to organizational/managerial topics, UCD methods and processes, and technical/ project issues. The benefit of the casebook and its organization is that it offers the new practitioner (as well as experienced practitioners working in new settings) the valuable practice in decision-making that one cannot get by reading a book or attending a seminar. The first User-Centered Design Casebook, with cases covering the key tasks and issues facing UCD practitioners today. Each chapter based on real world cases with complex problems, giving readers as close to a real-world experience as possible. Offers "the things you don't learn in school," such as innovative and hybrid solutions that were actually used on the problems discussed. Justifying, developing, and starting a UCD Program; Raising awareness and educating others in the work enviornment; Hiring UCD professionals; Estimating and pricing a UCD effort; Selecting appropriate user research methodologies; Selecting appropriate evaluation methodologies; Designing a user iterface; Designing user help; Web site information architecture; Addressing accessibility issues (i.e. designing for those with disabilities); Applying UCD to middleware/products with no obvious user interface; Managing the politics of UCD in the Workplace; Recruiting for a UCD effort; Developing and delivering UCD training; Interplay of the business model/business requirements and user requirements; Cost-Justifying a UCD effort. This is a book for aspiring user-centered design (interaction design) practitioners as well as those with some experience, regardless of how they are and were trained. The market includes those with job titles such as user interface designer, interaction designer, usability engineer, information architect, technical writer, and similar titles--for those working on any type of product: web-based applications, web sites, commercial software, or electronic devices/information appliances. Carol Righi is a Director of User Experience at Perficient. 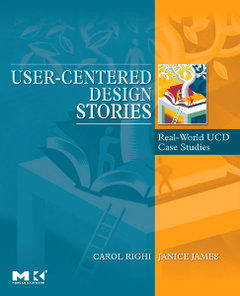 Carol has worked in User-Centered Design for more than 20 years and is widely considered a UCD thought leader. Carol has performed user research, usability evaluation, and interaction design for companies such as IBM, Google, Yahoo, Intuit, A. G. Edwards, Mapquest, Met Life, and many others. She has served as manager for numerous UCD efforts and has helped lead the development of the UCD competency in various organizations, including IBM. Carol has also designed and developed many standup and e-learning courses in UCD and has trained thousands of students. She received her undergraduate degree in psychology in 1981 and her Ph.D. in school/educational psychology with a concentration in computer applications to education in 1988, both from Fordham University in New York City. Janice James is Director of User Experience at Perficient and has more than 18 years of experience in the field of human factors, usability and user-centered design and development for software, hardware, travel, Internet, financial services, education, health care and retail products and services. During the last eight years as principal of her own consulting firm, Simply Usable through Design, she has focused on providing usability engineering and interface design consulting services to companies ranging in size from start-ups to Fortune 500s, including CNet, AOL/Netscape, Hewlett Packard, Unisys, Intuit, Humana, BestBuy.com, eBay, AARP and McGraw-Hill, to name a few. Janice has a broad range of experience in all types of usability and user-centered design processes. She also founded the Kentuckiana Chapter of STC and co-founded the Society for Technical Communications’ Professional Interest Committee on Usability.